In this article, Sarah Hillier reviews Their Space from a teenager's perspective. Are teenagers always as naive as adults tend to portray them? Sarah discusses, amongst other things, the importance of taking a pragmatic approach as against constant risk assessment. 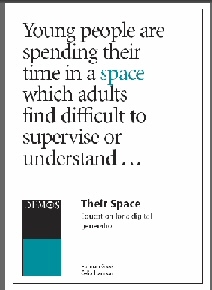 I have always been sceptical of adults trying to understand and evaluate teenage behaviour, so it was perhaps with a biased mind that I read the “Their Space” report on teenage use of technology. Indeed through most of my first reading of it my thoughts consisted mainly of “Well isn’t that obvious?” in regards to most of what was being said about today’s teens and technology. That isn’t a dig at the people who did the study – it is, at least in my mind, a compliment that they have managed to analyse the most difficult and hormonal human resources on the planet so effectively. I didn’t agree with all of it because, naturally, perspective on the issues of technology (and in particular focusing on views of internet safety) varies from person to person, but on the whole I thought it was a pretty good attempt at understanding teens and technology today. I had two somewhat minor uncertainties about what was being said; otherwise I thought that what they were saying was well-founded and true in my experiences. I won’t say that it was an interesting read for me though: it is like asking a religious person to read a book about why they should believe in God – I already knew and appreciated what they were telling me and so was not particularly interested by it. But for the adults who want to understand the relationship between teenagers and technology, I’m sure it would make an interesting read. My first impression was that the writers did not stress how small a group of “digital pioneers” there are. They are not a very large community and are not always viewed in such a respected light as they are painted in Their Space– most teens nowadays that I know, although relying on these “pioneers” for help getting into and improving their efficiency on Facebook and Myspace sites and for removing proxy detection from school and home computer systems so they can access forbidden sites, are still on the whole referring to them as “computer nerds/geeks”. Sad, but true I’m afraid. Teens hate it when adults put us into social groups, yet we are usually the most guilty of doing this (for example chavs, skets, emos, Goths and plastics are some of the terms used to define social groups by teenagers). My second thought, probably the thing that hit me the most, was that, yes, teenagers are not as apathetic to life as the media would have you believe, but when it comes to internet safety most teens are not the scrupulously safe kids quoted in the article. How many teenagers do I know that check out the strangers who add them on MSN or Myspace? Lots. How many of my friends and acquaintances ignore the results of looking up the complete strangers on Myspace or Facebook and add them regardless? I would say about 9.9 out of 10 out of the many people I have asked. I know most of my friends get a kick out of having a huge number of friends or contacts, and at least if they don’t think this way now, they used to. Indeed, I know lots of them get bored when they have received no comments, and so click on random people and add them without a second thought. This is particularly true of younger teens, not older teens. Now you might be saying to yourself, this is all very well but teenagers have social groups and this girl’s experiences probably only refer to her experiences with her own circle of mates. Well, I am one of the “drifters” of society and can go from group to group pretty easily. I have to say that my findings are pretty consistent between the social groups I know – they are pretty much are all the same when it comes to internet safety: it can go rot as long as I can chat to my mates. This is evident in the number of students who work tirelessly to find instant messaging URLs that work at school. It doesn’t matter that by doing this we can put ourselves at risk of having our school internet privileges taken from us as well as exposing ourselves to potential dangers that are always associated with online chat. When hearing about incidents of teenagers being put in danger or being taken advantage of by adults posing as kids on the internet, most of my friends do not really feel much sympathy for the children involved. We don’t take much notice of these risks because incidents like this happen so infrequently – it is easier to take the view that it would never happen to one of us than to constantly make risk assessments of everything we do. There is a much greater risk of being hurt by a stranger when walking down the street or out shopping. One of my school friends (aged 15) when I asked what she thought about the dangers of talking to strangers said “Well, that’s just tough isn’t it – if you’re stupid enough to talk to a weirdo on the internet what do you expect?”. This was just before she logged onto Myspace and accepted three new friends, all of whom she had never met before in her life. We also tend to ignore the risk of viruses. Ironically, about a year ago when I told another of my friends (aged 17) that my dad does not let me have MSN at home he said I should just disable the firewall. He did this to his PC a few years ago. Four months ago he had to spend a fortnight solidly trying to remove the 427 (I’m not exaggerating) viruses that had accumulated on his PC. Not all of my friends have such ironic stories but they almost all take the same view – to not have a link to interactive chat or blogs is to have an almost stunted social life and to be too overprotective of safety on the internet is to be irrational and generally a very boring person. Socialising is a very important part of teenage life and although the majority of teens would rather go out and meet up, we almost all rely on Instant Messaging to keep our friendships strong and to keep us going. Whilst being constantly surrounded by information where points of view and convention are constantly changing, it is nice to know that one thing can be depended on: friendship. If I had to choose between being able to talk to my friends freely and easily whenever I need or having complete internet safety I would choose to put myself at risk every time. I think most teens would agree with me. At the time of writing, Sarah Hillier was a teenager living in the UK.